I first came across this book some years ago in its French guise as 'La Vie dans les Châteaux Français, du Moyen Age à nos Jours'. I did think about buying it there and then, but decided that an English version would make more sense - once I'd finished with it I could search out a new and deserving home for it. The same book in French would prove more difficult to pass on or sell. Several months and bookshop searches later I carried my long awaited possession home and found an appropriate slot for it on one of my many bookshelves.And there it sat. Occasionally dipped into for some detail for research or information to answer a question. Sometimes consulted about a particular château or manoir as part of my musings about where I might spend my time on a future trip to France. But never actually read in its entirety, that is until I returned from my last trip and finally decided that I had to properly fill the gap in my knowledge.The author is an architectural historian, and the book includes many plans, illustrations and photographs. Some might think it to be an intense historical study. And in some respects it is. Despite that, it is also a compelling read. Girouard (and I believe that name has it's origins in Languedoc) demonstrates a keen interest in the human dimension of these vast homes and gardens. He begins with an introduction to the French aristocracy, how it worked and influenced life on the many estates. Moving forward through the centuries he shows how the language of chivalry is still prevalent today. He presents to us the details of a way of life that had existed for centuries and was finally brought to book and irrevocably changed by the catastrophic events of twentieth century.The research to put such a tome together, and it is a significant read at over 300 pages, must have been phenomenal. The acknowledgements and chapter notes at the back provide a very interesting list of documents, archives, diaries etc that had been consulted. As a plain and ordinary reader, I pick up a book expecting to be entertained. If I also improve my knowledge on a particular subject, I count that as an added bonus. What I definitely do not want as a reader is to be lectured. And a read of the foreword before I started the book made me a little apprehensive of the content. Perhaps that is why it has spent so much time on my bookshelves before being read in it's entirety. Having reached the final page and had a chance to absorb the extensive content, what I can now say is that it was a very interesting read. The narrative style flows easily which, in my view, makes this a book that anyone interested in France and its history would enjoy. 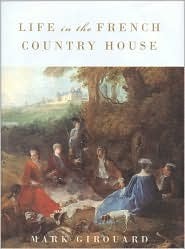 I read this in combination with Life in the English Country House: A Social and Architectural History and am discussing them together. . . .Both books start out with the medieval houses and households of lords and kings and lesser gentlemen and trace the history up to modern times. Which means, naturally, that they also trace the fortunes and practices of the nobility who lived in them. Not the same information for both. For instance, he talks about how one was supposed to become a French marquis or duke, or baron, or count: You had your land declared a marquisate, a dukedom, a barony, a county. In theory, you sold the land, you lost the title. In practice, you could give yourself the title and no one cared because it had no legal significance. He doesn't talk about how English nobles got their titles.Better to read English Country House first. The other contrasts French practice with English more often so it helps to know the English first.The households of the medieval English were enormous -- and virtually all male. A warband having undergone some modifications. And many members of it were high ranking; a servant could have three servants of his own. And the whole intricate framework of ceremony worked about it. These declined out of medieval times for all sorts of reasons: decline in violence, high-ranking men went into other fields which opened up, and royal disapproval of large groups. Also, the expense.The grand medieval hall where everyone ate retreated into all kinds of rooms for private eating. Again and again. Because as soon as, say, the lord ate in the great chamber instead of the hall, he would start eating in the privy chamber when he wanted some privacy.And the introduction of female servants, and the addition of libraries, and how the rise of the merchant class changed their ethos -- it was a major factor in their coming to regard some things as proper for the country and some for the city, because they represented the country and the agriculture while the merchants represented the city, and they embodied this architecturally.The slow progress of modern conveniences into the home. Some only because you couldn't get servants to put up with doing without them.Now, in a French house, there was a lot less ceremony. Partly because in France, you did not work from the immensely graduated degrees of status. You had nobles -- and everyone of noble descent was noble -- and then the rest of them. They would never eat together, not even with the carefully ranked tables that the English had. But you had the same sort of retreat into more and more rooms. Not exactly the same -- access was easier in France -- but the rooms did proliferate.For the French, of course, the houses didn't have the political necessity that the English ones did. You didn't have to persuade your freeholders to vote as you wanted them to. But there was hunting, and then it was also cheaper. It's hard to figure out whether they spent much time in their chateaus because writers in the same era would write "People used to go to their chateaus a lot when I was a child but not any more" and "People go to their chateaus a lot more than they used to when I was a child." Courtiers dancing attendance on the king didn't have much chance, but other apparently did.After the revolution, of course, you got a lot more. The English nobles lived in their country houses; the English didn't have a revolution, therefore the French nobles should have, and should now, live in their country houses. QEDAnd a large number still have their chateaus, although it can still be interesting keeping them going.Useful books for writers. Especially since they offer different possibilities. The author’s Life in the English Country House has become a classic of domestic anthropology, an examination of the British aristocracy and landed gentry through an exploration of its preferred places of residence. When I became aware of this successor volume (it’s not a “sequel”) shortly after it first appeared, I had my doubts. I know enough about the history of the upper classes in Britain, compared to nobility on the Continent, to be aware of the very great differences between them, both in origin and in psychology. Girouard tells you up front that what he’s considering here are the châteaux and seigneurial mansions from the 14th century to the modern era, leaving out Parisian residences and also royal palaces. (Fontainebleau and Versailles are not at all typical of French chateaux, the way Windsor Castle might be regarded as basically an oversized English gentleman’s country house.) The architectural traditions in France are quite different from those in Britain, of course, because the political and social history is so different -- France also has been overrun by occupying forces on several occasions who either heavily damaged or completely destroyed many of the châteaux -- and the author does his usual excellent job of leading the reader through them and sorting out what was typical from what was innovative. French country residences among the wealthy and titled tend to be far more lavish (on average) than is the case in Britain, but this is largely because the château had a rather different traditional role in the French family. And as the narrative approaches the present, it becomes obvious that the French upper class has sought solutions to the greatly increased expense of maintaining a large country home which are not that much different from those in Britain.One of the best sections of the book, actually, are the first two chapters, “A Quick Run Round the French Noblesse” and “The Language of Chivalry,” which comprise one of the best introductions I have seen to the French system of titles and nobility. Girouard has no new insights to offer here but he provides a very good and understandable explanation of those differences I mentioned above. If you loved his earlier classic, you ought to appreciate this one as well. God, I live for books like this. The little bits picked up skimming were fascinating and provoking: the medieval towers and moats that were retained alongside italianate renovations in order to preserve "the silhouette of traditional seignorial power"; the discussion of cabinets and boudoirs, from which Girouard expands into a notice of the "gentle eroticism" signified by the female toilette in 18th century French literature and painting. Mark Girouard - Mark Girouard FSA (born 1931) is a British architectural writer, an authority on the country house, an architectural historian, and biographer of James Stirling.